In the web menu, choose Dashboard in order to return to the main page of the application. This page contains a graphic summary of your e-shop(s) activity on Moneymailme application. An overview section of your virtual wallet with: current balance, total amount of incoming payments for the current month, total amount of paid fees for the current month. An overview section for each of your e-shops, for the current month, with number of orders and total amounts for all the orders statuses that Moneymailme application recognizes. 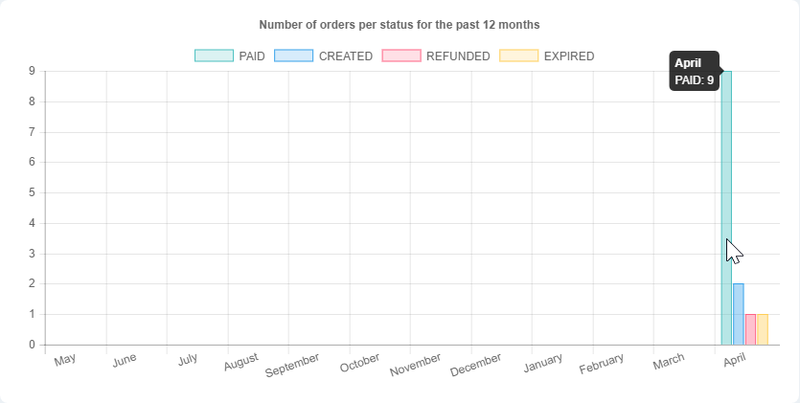 An overview section for each of your e-shops, for the past 12 months, with the number of orders for all the orders statuses that Moneymailme application recognizes. Note: In order to download data for your e-shop(s) orders, go to Reports section.